Girls receive program badges when they accomplish a new skill, learn information or perform service to others. Each branch of the girl program has different badges that are awarded. Girls also receive program-based certificates of achievement from their guiders or as part of an award ceremony. There are Enrollment, Advancement, Program Completion and Awards ceremonies for girls. These are often locally-based and held as a unit or in conjunction with other units. Some awards are also presented to girls at provincial recognition ceremonies. The list of Rangers eligible for the Youth Commitment Award will be generated from the iMIS records. Certificates are sent automatically in the Spring to the Ranger Contact Guider for presentation to all eligible members. No application is necessary. This application is to be filled out by an adult member of Guiding (cannot be a relative of the member). Two supporting nomination letters are required and the completed application. One is to be a non-member of Guiding in her community (i.e. teacher, clergy, other organization). Award nomination application (this application is required to be uploaded as the third supporting letter in Fluid Review). The Outstanding Youth Award recognizes and celebrates the accomplishments of Rangers and Pathfinders who exemplify their dedication to Guiding and their community. The Gold Thanks pin may be given to a girl or adult member for exceptional service to Guiding and may be given more than once to the same person. The Team Award may be given to each member who has been part of a team that planned and carried to completion an extraordinary event or project. The award is primarily intended as an adult award, but there are times when girls have been part of a team and can be granted the award. A member may receive the Team Award more than once. Girls in Guiding do amazing things every day. They leap into action, overcome obstacles, come up with brilliant ideas, and pretty much add a little bit of awesomeness to the world around them. Now it's time to be recognized! 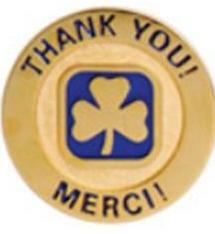 Girl Guides of Canada, Ontario Council recognizes the importance of continuing education. That’s why we offer scholarship programs to encourage further education of our active members. Use the links below to learn more about these programs, including eligibility requirements and how to apply. A gathering of all the Pathfinder, Ranger and adult award recipients within a city or neighbourhood. A gathering of all the units (from Sparks to Rangers) within a neighbourhood. A special event that includes an advancement ceremony for all of the units in a town plus the presentation of Canada Cord and Trail Blazer Leadership Award - Gold Award pins and leader recognition awards.